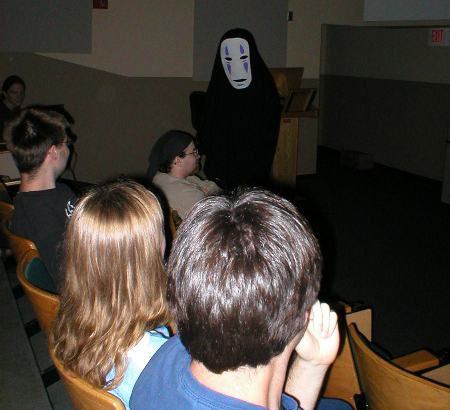 During the summer, the Anime Club of UW Madison falls back to meetings only once a month. We make up for it by having two days of marathon, 8-hour sessions. The July meeting for the summer of 2003 took place on Saturday and Sunday the 12th and 13th. The theme; all things Hayao Miyazaki. An attempt was made to watch as many of Miyazaki's movies as we could in reverse chronological order, beginning with Spirited Away. In this spirit (no pun inten... oh who am I kidding? Pun intended! ^_~), I decided to dress up as the protagonist of Spirited Away, Chihiro. Working with a total of about two hours when all the snips and snibbles of time were added up, I came up with something passable. A trip to Rockstock got me the cheap, short kimono in Chihiro-pink and I wore my pink sweat pants with it. A red strip of fabric made the belt and three yards of white ribbon served to tie back the kimono sleeves. Since it was very much the wrong type of kimono (I found out later, looking at the cover art for the DVD), I pinned the front closed with safty pins to more closely resemble Chihiro's outfit. The challenge I had with this costume... the hair. I have a lot more than Chihiro does. I tried to make my hair look like hers and I finally had to settle for no bangs, a longer piny tail, and two loose wisps wrapped around the back of my head to take up some length and then secured behind my ears with bobby pins. Today's experiment... FAILED! I should never do anything more intricate than a braid on myself. It doesn't work. 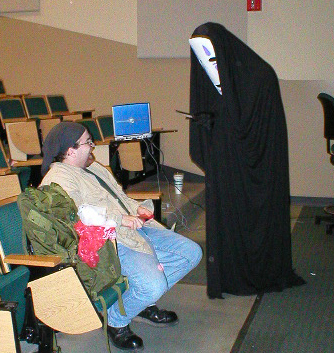 Since he had one soap token left from his adventures at Anime Central, Gung Ho Otaku member Bob decided to trot out his NoFace costume again and turn the tables on the club prankster, Eric. 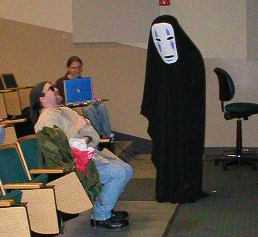 As Spirited Away was ending, Bob and I disappeared from the room and I helped him get into the costume. Then, as the credits began rolling, I entered and he hung back in the doorway where no one could see him. After a while, as the credits still rolled, he began to drift into the room. One by one, snickers went up from the room as his white mask appeared in the dim light. Finally, Bob loomed closer to Eric and the lights went up. Bob handed Eric the soap token, then proceeded to stare at Eric for several moments. When Eric began to protest, Bob brought out a knife and a fork and held them up, hungrily. Fast Facts: Miyazaki Fest was held in rooms 2650 (Saturday) and 1641 (Sunday) of the Humanities building on campus. Movies watched included Spirited Away, Princess Mononoke, Kiki's Delivery Service, On Your Mark, My Neighbor Totoro, Pom Poko, and Castle of Cagliostro. This page was created on 7/13/03 by Berzerker_prime.